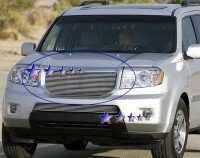 H86597A: 09-11 Honda Pilot Billet Grille Insert. This polished billet grille Installs into the existing grille with some modification required. Comes complete with hardware and instructions. Matching bumper billet grille is also available above as an additional item. Backed by manufacturers one year warranty. Imported.